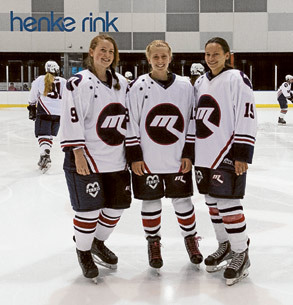 Isobel Cantrill and Ebony Rama, both aged 15 and Emily Davis-Tope, aged 14, are the three youngest members of Melbourne Ice Women’s (MIW) team. In January, the trio will head to Austria to represent Australia at the 2016 International Ice Hockey Federation U18 Women’s World Championship qualifier. Isobel said she had been playing with the Australian U18 Women’s Ice Hockey team for three years. While team members are spread across Australia, Isobel said when the team meets it was like they had never parted. “Personally, I feel like I am part of a massive family when I play with them. We all know each other like the backs of our hands and this shows when we get on the ice,” Isobel said. “If we do come first we will then move onto the actual world championships, which would be a massive achievement because that would be the first time the Australian under18s women’s team has qualified,” Isobel said. Isobel, Ebony and Emily will compete at the International Ice Hockey Federation Under 18 Women’s World Champion Division One qualification event in Austria from January 7 to 11.